Caption slip reads: "Photographer: Mitchell. Date: 1958-01-03. Reporter: Pony Garter. Assignment: Charles Finn goes to jail on contempt charges. 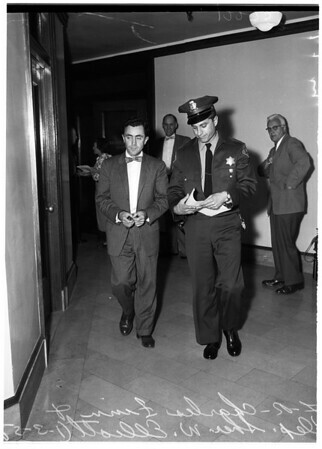 57: L-R: Deputy Sheriff W. Elliot puts hand cuffs on Charles Finn. 58-59: L-R: Charles Finn and Deputy Sheriff W. Elliot".